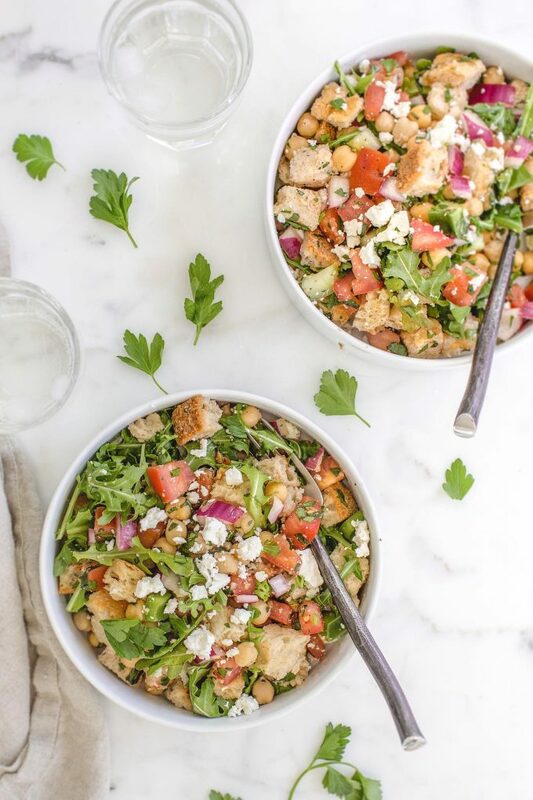 Sweet tomatoes and sourdough bread are the foundation of any panzanella salad recipe (a traditional Tuscan bread salad), and they’re all the more delicious with salty feta cheese, spicy arugula, and a refreshing handful of basil and parsley. If one sign of getting older is constantly remarking at how quickly time passes these days, then I’m aging rapidly. I blink, and it’s Monday again. I look up, and the month’s over. I swear I go to sleep and–oh, spring! I didn’t expect to be saying this, but I already miss the coziness of winter. But then I think about how good it feels to wear flip flops, to be outside when it’s 75 and sunshine-y, to be able to buy a million fresh fruits and veggies…and it’s like, winter who?! It happens just the same way every year around April–I feel this urge to spring clean what I eat. I move out of my piping hot comfort food phase and into my cold salads period. To make the transition a little smoother, I make sure my salads are nice and hearty. That’s why this panzanella does the trick. It’s filling and packed with a variety of flavors and texture–satisfying on every level. 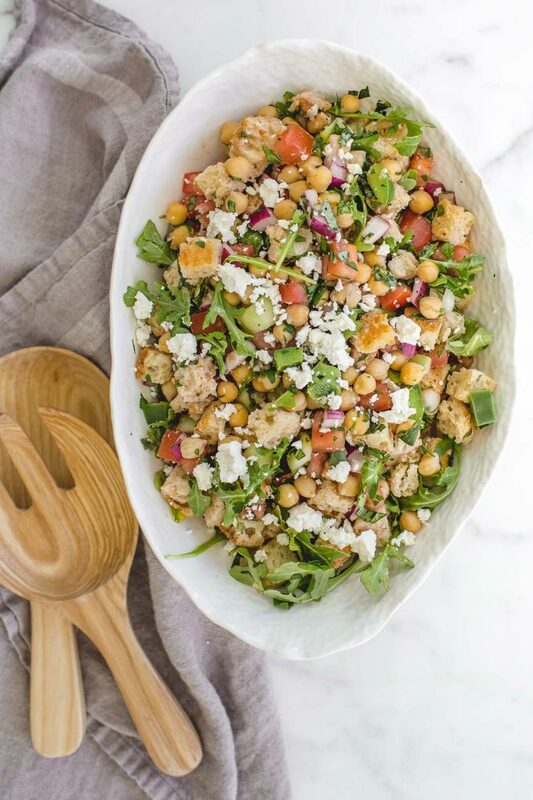 Sweet tomatoes and sourdough bread are the foundation of any panzanella salad, and they’re all the more delicious with salty feta, spicy arugula, and a refreshing handful of basil and parsley. A generous pour of good quality olive oil and a few glugs of red wine vinegar tie all the flavors together. 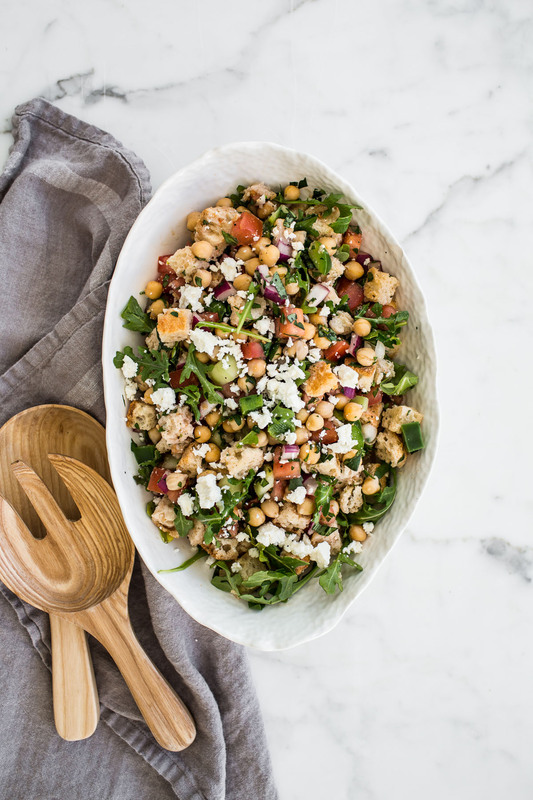 I like to serve panzanella as a side, with grilled fish or chicken, but the chickpeas and feta provide protein for staying power on its own, too! In a large bowl, whisk the vinegar, olive oil, garlic, salt, and pepper. Add the tomato, cucumber, bell pepper, onion, and chickpeas, and toss to coat. Cover and let marinate at room temperature for at least 20 minutes and up to 2 hours. Add the bread, arugula, parsley, basil, and feta, and toss to combine. Serve immediately. I would love to ask you in person how you fight to keep weight off every. single. day. This is my problem – I lose weight on a diet then go back to my old ways. Balance is HARD. And now I’ve got baby weight to lose! It feels like a never ending battle. Also, I mis-read the directions and posted this on Instagram :) Whoops! Thanks and can’t wait to try this recipe! Thank you Miranda! I hear you on how challenging it can be to find balance. It’s a practice and a choice every day, and some days are easier than others. Are you in NYC? So true! I just popped on your site because I’m having a particularly challenging morning and I’m faced with a sea salt dark chocolate caramel or a banana. Admittedly, the chocolate won but I only had one :) I’m close to NYC…I live in Philly but we’re a hop, skip and a jump away from New York! What do you love most about working out? How do you stay motivated through hard workouts? One thing you said in your book that stuck with me was when you were running on the treadmill and said something along the lines of how hating it is not going to make the time go by faster. That really stuck with me because there are so many times when I just want to get through this workout and being miserable is not going to help the clock speed up! Ah such a good one! I love that you remember that line from It Was Me All Along!! Thank you! Are you in/near NYC? Time definitely flies faster as you age!! I still can’t believe it’s Spring. Totally ready for it though!! And salads like this. I love the parsley in there! This salad looks fierce and has me so excited for salad season. I would LOVE to attend the Eat and Greet and ask you how you go about lightening up family recipes in a way that fits in your balanced lifestyle but also honors your family history and reassures family the traditions are being passed on. My mom seems really hurt that I cook more recipes from blogs than ones she used to make. I really want to find a way to show her I value the food she raised me on while also continuing with the healthy habits I’ve been building. Ahh….lucky folks getting to hug it out in person with you! I won’t be able to ask in person at this event but since you are asking…Do you have a routine/set of habits that you are currently working from? I’m reading a book by Mason Currey called “Daily Rituals” right now and it isn’t by any means a book I think would fascinate other people…but the mundane every day patterns of successful people are infinitely fascinating to me. Do you and Daniel still keep different schedules? If so, does it still bug you? What are you watching these days? Do you still clean a lot? What’s your cleaning routine? Or is there no routine and are you like me and feel like every task and thing can be winged and binged in life, not just food? How many times a week do you grocery shop? What is your beauty routine? Do you dye your hair? How do I work from home and feel like I can barely shower on a regular basis (don’t answer that one). Where is your time spent, wasted, used well? Gah these questions are FANTASTIC. I want to answer all of them–and it gets me thinking that I should do a whole post with a Q&A! Love you, H! Thank you, Erica! I think the topic you bring up is so important, and 100% something I’d love to talk about! Are you near NYC? I am not far from NYC, in NJ! It would be amazing to be able to share a meal with you! Like you, I’ve suffered from recurrent bouts of depression throughout of my life, so I’d love to know how you reconcile that part of yourself and your history with the rest of your personality, your relationships, your success. I’ve heard a few interviews with you and I’m always amazed by how positive, resilient, and compassionate you are. For me, even when things are going well I worry that the depression is who I *really* am and that it will come back to haunt me. How can someone like me move past that fear and live well in the present moment? Oh Laura good question! Thank you, first of all. Depression is something I really love to touch on because I think a lot of us go through bouts of it (some of us have longer, more intense ones, no doubt). It’s reminding me I should write another blog post about it, too. Cannot wait for YOUR new cookbook to come out next week. !!! One thing that kept returning to my mind as I read through your memoir was this question of passion. The things inside us that really make us come alive are all too often stuffed down underneath how hard it is to just get through the day sometimes. Alcohol for your dad, food for you (and me), shopping for some the list goes on. It seems to me that the way you’re achieving a “feel-good, balanced life,” as your blog title mentions, is by setting the food aside so that that which really makes you come alive is set free. So, that’s what I would ask you about if I could join for dinner: what your other passions are, but more than that, how you dig deep enough to even discover them when you grow up (as I did) burying the other components of yourself with every possible bit of added sugar. But then probably some hair tips to lighten it up, and because girl you have got some great hair. I love everything about this, Maggie. It speaks to one of my beliefs, which is, when you fill up your life with truly nourishing things (people, activities, work–that you love), you find that you don’t need to fill up as much on food. I’m so glad you brought this up. Are you in or around NYC? Yes, I live in DC and I’d be honored to make the trip for such a memorable evening! Hi Andie! I struggle with weight and your book has been my light house on the days that I feel just completely overwhelmed by this constant challenge or trying to change this relationship with food. If I was able to sit with you and ask you one question — I’d ask you if you think your relationship with Daniel has mimicked your relationship with food and vice versa? Meaning – it was so fulfilling and loving at first, then a little bit overbearing, then all or nothing then you found a balance. After reading your book and following your blog, I cant help but think you seem to be in the best place, the place you’ve always wanted to be in both your relationships (Daniel and food). I admire you because you’ve managed to change your “abusive” relationship with food into one where you’re in control and are empowered when its so easy to feel so weak. You give me hope that there is a light at the end of the tunnel. Hey Andie!! I would LOVE to meet you in person! As I read your memior, there were SO many moments that I deeply connected with – the relationship you built with food, the lack of instinct that tells your body and mind that you’re full, the moments you shared about growing up. One thing that hit me hard was as you were in middle school, finding out that just because your friends call you a “whale” behind your back doesn’t mean they don’t like you…wow! It still hits me hard. And we HAVE to be among a small population that went through two very specific experiences in high school. I don’t want to be a spoiler for anyone who hasn’t read your book, but the hints are “dance” and “out” . There was also your growing addiction yet resentment to working out, running, specifically. I was the same way, running not because I enjoyed it but because I thought I had to. I have since changed my ways and found I love Zumba and am now an instructor. So, tons to talk about but what’s my question to you? I’d like to talk and find out more about the mental shift and emotional journey you went through and continue to go through. I was 210 lbs in high school and through various methods, have made it to a fit, healthy 150. However, I want to and need to lose more for my height. Technically, I know what I need to do, but I feel like I’m holding myself back, like I’m holding unto something, or not getting over something or emotionally not there or ready to take it to the next level. What kept you focused and motivated especially as you approached your goal weight? Did you have daily practices that kept your mind and body on the right track? Would love to hear! If I’m not chosen for the dinner which is sure to be amazing, feel free to hit me up for a fun workout like Soulcycle or trampoline park…lol I’m in NJ too. I’d love to know more about your recipe inspiration and creative processes aka how you don’t burn out and reach for the seamless (it’s a blessing and a curse ) would love to get to meet you and can’t wait to read your new book ! My question would definitely be how did you find the motivation every day to keep the weight loss up? This salad looks so fresh and delicious. I’m wrapping up a freelance project in New Orleans right now and let’s just say I’m more than ready to head back to NY and lighten up my diet a bit! It would be amazing to meet up with you in person! Although I have a million things I’d love to chat with you about, I’d really love to learn more about how you always manage to put forth such a positive energy, even when you’re facing hardship. It’s something I’ve struggled with quite a bit, and a trait I’ve always admired in you. Oops, posted before I was finished. As a writer (or aspiring writer? sometimes I’m not sure which it is) trying to find my place in the professional world of NYC, staying positive and not giving up has been difficult for me. Any insight you could offer would be much appreciated. How did you adjust to being a new version of yourself? I think it is so hard to transition from pre-weight loss mentality to post-weight loss mentality and recognizing your new body. Would love some insight! I’ve said it before, and I’ll say it a thousand times – you are a real inspiration and have such a magical way of connecting with your readers…thank you! I find myself constantly battling with the guilt that comes with each bite of bread, cheese, candy, pastries, chips (…), and wonder how you deal with that. My head knows that one cupcake isn’t going to make me instantly gain weight, but when I look in the mirror, I go mental picking over every extra squish I find, whether it existed before or not. My inner critic is never satisfied, especially with my weight/body, and it would be so great to hear how you have calmed the critic in you. P.S. I have a girl crush on you! Has anyone been notified that they won yet? Hi Andie! Somehow I missed this post (gasp!) but after reading today’s weekly coffee date here I am. One question I would ask would have to be when you stop and look back at all the experiences you have had and the accomplishments under your belt in just 30 short years, what do you feel is the one characteristic or personality trait that you possess that has been a driving force in achieving your goals and how do you use that skill/trait to your advantage? Hi Andi, I listened to It Was Me All Along on tape–it was so great to hear your story in your voice! Your discussion of your mental health journey really helped me accept and embrace my own mental health issues. I remember going for a run but feeling too worn down to do my usual path next to the East River. Instead, I put on your book and went for a walk. I walked all the way down the east side of Manhattan and then back up the west side listening to you talk about Leo and therapy (I may have cried a little while walking past the Statue of Liberty). You are continually a great reminder that people with depression and other mental health issues can be happy and successful and 1000+ more things other than “depressed.” Something I think about all the time (hi, anxiety!) is maintenance of mental health and the fact that the work never ends. I would love to ask you about your thoughts on that type of upkeep and what you do to make sure you take care of yourself mentally. Thank you! I am just finishing up your first book and have identified with so much of what you’ve been through. Like you, I’ve been obsessive about food, exercise, and my body for as long as I can remember. I would love to ask you if you still feel obsessed with food? As I get older, I’ve found that it’s ebbed and flowed for me. Especially now, having had 2 sons, I feel less stressed about how I look and more in awe of what my body has been able to accomplish. It’s nice to finally have an appreciation for my body, perhaps for the first time in my life. I would absolutely love to meet you!! I would love to meet you. I live in CT. i loved your book and I love your blog. You are so authentic and your writing resonates with me. I would love to ask you…how do you stay motivated… I lose weight and as soon as someone tells me I look good I slip into my old ways.. Why do it.. How do you stay focused and keep going till you hit your goal and after… Loved your book.just read it and found your blog…. You are such an inspiration. I just finished reading your memoir and purchased your cookbook. I believe as stated in “The Big Night” that “To eat good food is to be close to God.” I am currently on a weight loss journey after IVF and two pregnancies 16 months apart. I want to maintain my passion for cooking and continue to lose weight. Most importantly, I want my two baby daughters to see a healthy, happy mother who loves her body. I want my babies to have a healthy relationship with food and pride in the miracles of our bodies. I have lost 37 pounds and have 50 to go. In your book, you mentioned that you needed to trust and let go. For instance, you mentioned that you had to trust that walking would allow you to lose weight or maintain as running did, and dessert and food in moderation would do the same. How did you learn to trust and let go? Did you just try walking and hope for the best? Did you introduce dessert and hope it worked out? What would you have done if it didn’t ? How did you overcome the fear? I am struggling with that. Thank you. I live in New Jersey. 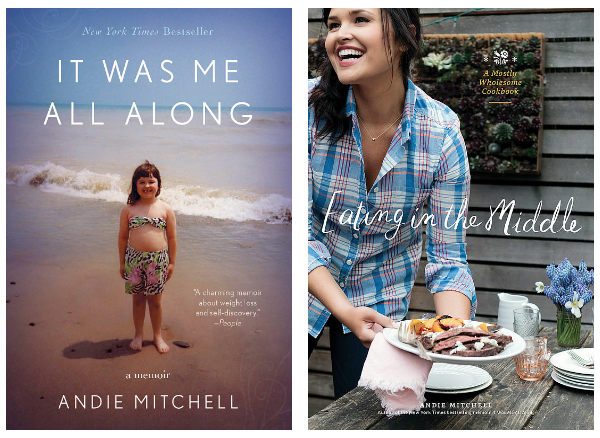 Andie, I am finishing up your book It Was Me All Along this afternoon. I related to the ups and downs, the extremes and the pursuit of balance detailed in your book on such a deep level. Thank you for this. What I would love to understand, is how you were able to introduce “unhealthy” foods into your diet in moderation. Meaning, how do you make the decision to add feta to your salad, or peanut butter to your smoothie, when you feel it is not “needed” for your nutrition and weight loss/maintenance without hindering progress and spurring anxiety and guilt? This is my biggest struggle in my own recovery and discovery of balance, I am fearful of foods that will hinder progress. Also, this salad looks delish, feta and all! I would love to ask you what you think the key to lasting female friendship is! I am in CT and can hop a train and be in NYC in less than two hours! I might be too late for this, but I’d love to ask you how it feels to eat normally – after years of overeating, does balance still feel like work or have you found peace with food? Does it feel “normal” to eat in the middle or do you still zero in on every bite? I think the thing that scares me most about losing weight is not being able to relax around food; I’m worried I’ll always feel like I’m at war with it.